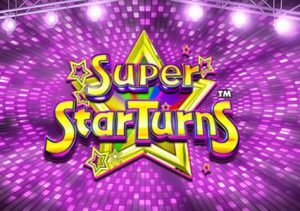 Looking not a million miles from the TV show Wheel of Fortune, Super StarTurns is a 5 reel, 40 payline video slot from Barcrest. The highlight here is the feature round where you’ll get to spin a bonus wheel where you can win up to 50 free spins and cash prizes of up to 500 times your total bet. Play on your PC, tablet or mobile device from between 10p and £500 per spin. There’s a flashy, gameshow feel to the design in Super StarTurns. Joining the A, K and Q are beachside cocktails, bottles of champers and wads of cash. Top of the standard symbol payers is the bright red sports car. Land 3, 4 or 5 of these and you’ll pocket an award of 0.5, 2 or 5 times your bet. There’s also a wild which replaces everything apart from the scatter. The wild can be very rewarding in its own right too. If you’re lucky enough to land 5 in a row you’ll pocket a payout of some 250 times your bet. Green Wheel – on offer here are between 4 and 8 free spins or an upgrade to the Blue Wheel. Blue Wheel – between 8 and 12 free spins, cash awards equal to between 20 and 50 times your total bet or an upgrade to the top Red Wheel are possible from the Blue Wheel. Red Wheel – the potential payouts here start at 250 but can rise to 500 times your bet. You could also land between 25 and 50 free spins. Regardless of which wheel you spin, all of the free spins, in the Free Spins Bonus feature, are played on a new wheel which is made up of the higher value symbols only. 1 extra free spin is added to your total too if you land a scatter on reel 5 during this feature. Like many Barcrest games, you’ll also have the opportunity to activate the Big Bet feature. This set of 5 linked spins will set you back £20, £30 or £50. In return you’ll see oversized scatters, an upgraded paytable and bigger rewards when you do trigger the Super StarTurns Bonus feature. The RTP increases too. At standard stakes it’s 94%. At £50 Big Bet Mode, is rises to 98%. For all its flashy design, we found Super StarTurns a little underwhelming. The phrase ‘all mouth and no trousers’ comes to mind here. Saying that, you can win 20,000 times your bet if you fill the reels with wilds with the £50 Big Bet mode. We found the features a bit disappointing. There’s no doubt the Red Wheel can deliver some big rewards. It’s hard to trigger it though. If you like a video slot that takes inspiration from a TV game show, then that’s what’s on offer here. I would rather play ELK Studios’ Hit It Big which is better on many levels.